VVOG | Sponsors | Sponsoren VVOG | NW Sports B.V. It all started from passion to the watersports back in 1996. Now 20 years later, we are a true European distributor of Premium Brand watersport products, with a strong focus on the Wake and Waterski industry. One source, everything a true (Pro) Watersports Shop needs. Here at NW Sports B.V. we strive to offer you all the products you need for you watersports business. All the premium brands from distributor, Fast European delivery and 24/7 online access to our warehouse. NW Sports B.V. Offers a wide range of high-end brands available in the watersports market. 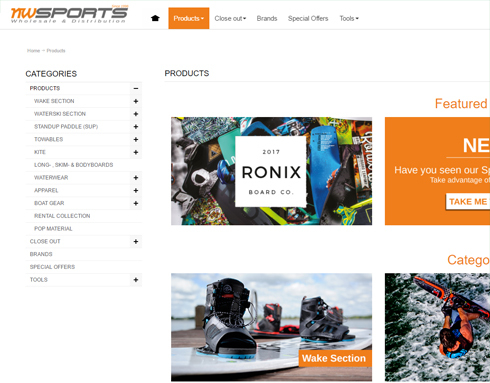 With big brands like Hyperlite, Ronix, HO Sports, Radar, Connelly, Roswell, Follow and many more, we are the one of the strongest players in the European watersports industry. Always aware of the available stock, 24 hours a day. Our B2B dealer portal is always on hand, also in the weekends. Place your order at your convenience and we take care of the rest.